The assessment will take approximately 30 minutes to complete and was developed to provide an interactive online assessment tool. A complementary e-learning programme is also available. The target group of healthcare professionals includes Primary Care practice nurses and healthcare assistants. The programme provides a comprehensive assessment tool for all healthcare professionals who care for people with diabetes. Given the variation in diabetes footcare across the country, the e-learning programme will contribute to reducing the variation in amputation rates and improve practice in screening and assessment. This will lead to prompt and appropriate referral to the diabetes specialist foot services resulting in reduced length of hospital stay and amputation rates. The assessment was developed in partnership between Health Education England e-Learning for Healthcare (HEE e-LfH) and Sussex and East Surrey Sustainability and Transformation Partnership (STP). The tool is also supported by the South East Clinical Network and The British Association of Prosthetists and Orthotists (BAPO). It will be rolled out as part of a National Diabetes Treatment and Care Programme across the Sussex and East Surrey STP and beyond. If you already have an account with e-LfH, then you can enrol on to the Diabetic Foot Screening – Interactive Assessment programme by logging in to the e-LfH Hub, selecting My Account > Enrolment and selecting the programme. You can then access the programme immediately in the My e-Learning section. In the event that you do not qualify for free access to the Diabetic Foot Screening – Interactive Assessment programme via the e-LfH Hub, you may be able to access the service via OpenAthens. 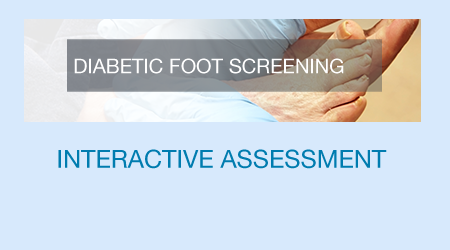 The Diabetic Foot Screening – Interactive Assessment programme is also available to NHS healthcare staff via the Electronic Staff Record (ESR). Accessing this e-Learning via ESR means that your completions will transfer with you throughout your NHS career.